(i) "Bookshop UK" means SkillsClinic Limited of 145-157 St John Street, London, EC1V 4PW, England trading as Bookshop UK, any connected organisation that actually supplies Goods ordered by the Customer and any successor to its business. (ii) "Goods" shall mean all goods and services which the Customer agrees to buy from Bookshop UK including replacements for defective Goods. For the sake of clarification the words ‘Goods’ and ‘item(s)’ are used throughout these Terms and Conditions and refer to the products and services supplied by Bookshop UK. (iii) "Contract" shall mean the Contract between Bookshop UK and the Customer for the sale of Goods by Bookshop UK to the Customer. (iv) "Customer" shall mean the person(s), company or any other organisation that purchases or agrees to purchase Goods whether a Consumer Trade or Credit Customer. (v) "Customer's Registered Address" shall mean the address of the Customer that is already registered with Bookshop UK or the address registered with the issuing company of any debit or credit card which is used as a means of payment for Goods. 2.1 All orders for Goods are accepted by Bookshop UK subject to these terms and conditions of sale which supersede any other terms and conditions previously published. These constitute the entire understanding between Bookshop UK and the Customer for the sale of Goods. 2.2 A description of the Goods and the price of Goods is stated on the website of Bookshop UK. 2.3 Delivery and cancellation rights, and information about Bookshop UK are set out in these Terms and Conditions. 2.4 These conditions shall apply to all Contracts for sale of Goods by Bookshop UK to the Customer to the exclusion of all other terms and conditions including any which the Customer may purport to apply under any purchase order, confirmation of order or any such similar document. 2.5 No variation or addition to these Conditions shall be effective unless agreed in writing by Bookshop UK. 2.6 Any typographical, clerical or other error or omission in any sales literature, quotation, price list, acceptance of offer, invoice or other document or information issued by Bookshop UK shall be subject to correction without any liability on the part of Bookshop UK and without any prior notification. The views and opinions expressed in any sales literature or on social media sites or on the website of Bookshop UK or other websites are the views of the contributors and should not be taken necessarily as fact or the views of Bookshop UK. 2.7 Placing an order and or acceptance of delivery of Goods shall be deemed conclusive evidence of the Customer’s acceptance of these Terms and Conditions. 2.8 All descriptions and illustrations contained within the website or documentation provided or any price list or otherwise communicated to the Customer are intended as guidance only and illustrations and descriptions may vary. Bookshop UK will use its best endeavours to ensure that all descriptions and advice offered are correct, but it is the Customer’s responsibility to ensure that the requirements and expectations and use of the product in the way intended by the Customer can be satisfied by using the product. 2.9 If the description of any Goods which are not directly manufactured by Bookshop UK contained in any correspondence, invoice or the website varies from that of the manufacturer’s description, then the manufacturer's description will be deemed to be the correct description and shall take precedence over the description assigned by Bookshop UK. 2.10 If the Customer has a specific purpose in mind when purchasing Goods, Bookshop UK will not be liable if the Goods are not reasonably fit for that specific intended purpose. Our liability for fitness for the purpose shall be that the Goods supplied will be fit for the purpose of which such Goods are generally supplied and shall not be any more specific than that. 2.11 The responsibility for ensuring that Goods are sufficient and suitable for the Customer's requirements rests with the Customer. 2.12 Bookshop UK reserves the right to decline to trade with any person(s), company or any other organisation without issuing any reason. Notwithstanding any other provisions of these Terms and Conditions, Bookshop UK may decline to accept any order, whether or not payment has been received, by giving notice of non-acceptance to the Customer by post, email, facsimile or telephone. In the event that Bookshop UK declines to accept an order in respect of which payment has been received, the full amount of such payment will be refunded. 2.13 Bookshop UK reserves the right to terminate any Customer account, including online accounts and usernames, without reason. 2.14 By placing an order with Bookshop UK the Customer agrees to data relating to the transaction being retained and processed by Bookshop UK in accordance with the Data Protection Act 1998 or any statutory modification thereof. The data so retained will be used by Bookshop UK for the purpose of accounting and marketing and will not be disclosed to any third party (unless legally required to do so). 2.15 Payments must be received in full by Bookshop UK when placing an order and Goods will not be supplied until such payments have been made. In the case of payments requiring clearing, such as cheque payments or electronic transfers, such payments will need to be received in full cleared funds by Bookshop UK before Goods are supplied. In the case of failed Payment or negative security checks the Contract between Bookshop UK and the Customer shall be subject to cancellation by Bookshop UK, and Bookshop UK will have no obligation to supply or deliver the Goods to the Customer, but this is without prejudice to the rights of Bookshop UK for compensation and/or damages for breach of Contract. 2.16 With prior written agreement and permission, in the event that Bookshop UK allows supply of Goods prior to payment being received by Bookshop UK, the Customer shall be required to make full payment in respect of the order by the stipulated payment date stated on the invoice. Failure of the Customer to make payment by the stipulated date on the invoice shall result in the addition of a penalty charge being added to the total amount due, the penalty charge being 20% of the total payment due. With an additional penalty charge being calculated every seven calendar days pro rata to the amount of 20% of the accrued total due, with penalty charge being added weekly until the total amount due is paid. 2.17 Each and every clause and element of clause in these Terms and Conditions shall, so far as reasonably practicable, be construed separately from any other clause or part of clause in these Terms and Conditions and shall if necessary be applied separately. 2.18 For the sake of clarification, in the event that a Customer sends written notice to Bookshop UK by post or email, it shall only have been deemed delivered where Proof of Delivery is available. Proof of Posting or telephone communications are not acceptable proof of receipt by Bookshop UK. In the case of emails, proof of delivery of an email by a Customer to Bookshop UK will be deemed acceptable upon production of a return email reply sent by Bookshop UK. In the event that Bookshop UK does not reply to a Customer's email, this is likely because it has not been received. 2.19 Bookshop UK operate a complaints handling procedure which is used to try to resolve disputes when they first arise. If you have a complaint, please contact the Customer Service Manager at the following address: PO Box 414, Dartford, DA1 9LF (this is a correspondence address only). 2.20 Any contract for purchases made through the Bookshop UK website will be with Bookshop UK which is a trading name of SkillsClinic Limited whose registered office is situated at 145-157 St John Street, London, EC1V 4PW, England, Company Number 06310040 and VAT Number GB912180948. 3.1 Bookshop UK must receive payment of the whole of the price for the Goods that the Customer orders before the order can be accepted, and the contract formed. Payment is not taken until the point of despatch of the Goods to the Customer from the distribution centre. Once payment has been received Bookshop UK will confirm that the order has been received by sending an email to the Customer at the email address provided by the Customer in their registration form. The shipment email will include the Customer's name, the order number and the total price. The acceptance by Bookshop UK of the Customer’s order brings into existence a legally binding contract between Bookshop UK and the Customer on these Terms and Conditions. Any term sought to be imposed by the Customer in the order will not form part of the Contract. 3.2 Bookshop UK is entitled to withdraw from any Contract in the case of obvious errors or inaccuracies regarding the Goods appearing on the website. If an error or inaccuracy is discovered with regards to the advertised price of the Goods that the Customer has ordered, Bookshop UK will contact the customer as soon as possible by email. This will be to inform the Customer of the correct price of the Goods, and to ask if the Customer wishes to continue with the order at the amended price, or to cancel the order altogether. 3.3 If Bookshop UK has insufficient stock to deliver the Goods ordered by the Customer, Bookshop UK will notify the customer as soon as possible and any sum debited by Bookshop UK from the Customer will be re-credited to the Customer and Bookshop UK will notify the Customer by email at the address given by the Customer in the order form. Notwithstanding Clause 8.3 the refund will be made as soon as possible and in any event within 30 days of the order. Bookshop UK will not be obliged to offer any additional compensation for loss, damages, consequential loss or disappointment suffered. 3.4 Bookshop UK endeavours to bring customers the best value possible by running special offers, but please remember stocks are limited at the special offer price, and subject to availability. The Bookshop UK website is updated as quickly as possible to minimise disappointment. The process of updating the website when Goods have sold out at promotional price can take a few hours or days to update. 3.5 Multi-buy offers. Promotions apply to listed Goods only, which are subject to change and availability. If the Customer chooses to purchase an item from a multi-buy offer, but does not purchase enough items to qualify for the special discount, the item will be charged at the normal price. Please note that on 3 for 2 promotions (and other multi-buy offers), the lowest priced item will always be the 'free' item. 4.1 When you register with the Bookshop UK website, you will be required to choose a contact email address and password. You are responsible for all sessions and transactions taken under these details. You should keep your password safe and not disclose it to anyone. You should change it immediately if you feel it has been compromised. 4.2 If any of your details change, such as your debit card or credit card billing address, you must inform Bookshop UK as soon as possible. You may update your details by signing into your account on the Bookshop UK website, and update the relevant section. 5.1 Prices of items exclude postage and packing. Costs of postage and packaging are displayed when placing orders. Standard delivery means a delivery method chosen by Bookshop UK which can take 3 – 10 working days. Next day delivery means a delivery method chosen by Bookshop UK which will ensure delivery of the Goods the following working day before 18:00 hours. International delivery can be between 3 – 28 days depending on postal and courier services and the type of delivery chosen by the Customer. 5.2 The risk of damage to or loss of Goods ordered from Bookshop UK will pass to the Customer when the Goods are despatched to the Customer from the Bookshop UK distribution centre. 5.3 The delivery time is calculated from the date Bookshop UK despatches the Goods and not from the date of order. Delivery will be made as soon as possible after the order is accepted and in any event within 30 days of despatch of the order. 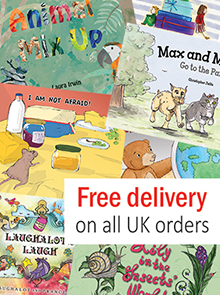 All delivery times quoted on the Bookshop UK website are estimates only, based on availability, normal processing and delivery companies. 5.4 Bookshop UK will post, or arrange a courier on behalf of the Customer, for the Goods ordered by the Customer for delivery to the person and address given to Bookshop UK at the time the Customer makes the order. For Goods delivered outside of the EU, the consignee (i.e. the person to whom the consignment is sent) will be the declarant and importer into the country for which the consignment is destined. The consignee will be responsible for both customs clearance and payment of customs duties and local taxes where required. 5.5 If the Customer is ordering Goods for delivery outside of the EU, please note that the consignment may be subject to import duties and taxes, which are levied once the Goods reach the country of destination. Any such charges levied in relation to customs clearance must be borne by the Customer. It is accepted by the Customer that Bookshop UK has no control over additional charges in relation to customs clearance. Bookshop UK recommends that you check with your local customs officials or post office for more information regarding importation taxes/duties that may be applicable to the order and the Goods. 5.6 Delivery will be made to the Customer's registered address. Or an alternative address specified during the order process. The Customer shall make the necessary arrangements to take delivery of Goods whenever they are tendered for delivery. Bookshop UK shall not be liable in any way whatsoever for failure of the Goods to be delivered. 5.7 In the event that a Customer is unable to accept a delivery when such an attempt is made and then the Customer requires re-delivery of Goods from the courier or postal service, then any cost for this re-delivery shall be paid by the Customer. 5.8 In the event that a Customer chooses a standard delivery option for delivery of Goods, Bookshop UK reserves the right to deliver the goods by an alternative method at its own expense, including but not limited to tracked delivery, signed delivery, courier delivery, next day delivery, recorded delivery. 5.9 The delivery date should be taken as the anticipated date of delivery but it is an estimate only and should not be taken as contractually binding. Whereas Bookshop UK will make reasonable efforts to deliver Goods on the estimated or confirmed delivery date, Bookshop UK will not be liable for late delivery. 5.10 Bookshop UK also reserves the right to deliver Goods before or after the estimated or confirmed delivery date and shall not be in breach of Contract should delivery occur before or after the estimated or confirmed delivery date. In any case, Bookshop UK shall attempt to deliver the Goods as soon as possible and in any event shall deliver the Goods to the Customer’s delivery address within 30 days after an order is received and accepted. 5.11 Bookshop UK shall not be liable to compensate the Customer by way of damages or otherwise for non-delivery or late delivery of the Goods or any part of the Goods or for any loss consequential or otherwise arising from non-delivery or late delivery. 5.12 Whilst every reasonable effort shall be made to keep to any estimated or confirmed delivery date, time of delivery shall not be of the essence and Bookshop UK shall not be liable for any losses, consequential losses, costs, damages or expenses incurred by the Customer or any other person(s), company or organisation, arising directly or indirectly, out of any failure to meet any estimated or confirmed delivery date. 5.13 The Customer must inspect the Goods as soon as reasonably practicable after delivery and shall within seven days of such delivery give notice to Bookshop UK by email of any damage or defect in the Goods. 5.14 If the Customer fails to give such notice, the Goods shall be conclusively presumed to be in all respects in accordance with the Contract and free from any damage or defect which would be apparent on reasonable examination, and the Customer shall be deemed to have accepted the Goods accordingly. 5.15 Bookshop UK reserves the right to cancel delivery of any goods where payment by the Customer has not been made in accordance with the Contract and or these Terms and Conditions, or where any security check has proved negative, or where invoice payment has not been agreed in writing prior to the ordering of Goods. 6.1 If the Customer is an individual and is not buying Goods on behalf of a business, there are certain circumstances in which the Customer may cancel the Contract and these are set out here in Clause 6.0 and its subsections. This right to cancel does not apply to business buyers. 6.2 The Customer may cancel the order for Goods at any time up to the end of the seventh working day after the Customer receives the Goods. 6.3 The only circumstance in which the Customer cannot cancel the order is where the Customer has taken the ordered Goods out of the sealed package in which they were delivered. 6.4 To cancel the order the Customer must notify Bookshop UK and obtain a RMA number, following the procedure set out in these Terms and Conditions. 6.5 If the Customer receives Goods before cancelling the order then, unless the Customer has lost their right to cancel because they have taken the Goods out of their sealed package, the Customer must send the Goods back to Bookshop UK at the Customer’s own cost and risk, unless the Goods were supplied faulty. If the Customer cancels the order but Bookshop UK has already processed the Goods for delivery and the Customer receives the Goods, the Customer must not unpack the Goods when they are received and must send the Goods back to Bookshop UK at the Customer’s your own cost and risk, following the Returns procedure described in these Terms and Conditions. 6.6 Once the Customer has notified Bookshop UK that the Customer is cancelling the order, any sum debited to Bookshop UK from the Customer will be re-credited to the Customer as soon as possible and in any event within 30 days of the order date, subject to Clauses 7.0 and 8.0 and their subsections. 7.2 Notwithstanding Clause 7.26 the Customer is responsible for payment of postage and packaging when returning Goods to Bookshop UK. The Customer is responsible for insuring the Goods whilst they are in transit to Bookshop UK. 7.3 In the case of all returns, the Customer will require a Return Merchandise Authorisation number (RMA) before item(s) can be returned to Bookshop UK. Please request an RMA number by writing to Bookshop UK by email. In your request for a RMA please include your name, email address, telephone number and also include details of the reason for the return. 7.4 Bookshop UK reserves the right to attempt to resolve any issue with any of the Goods prior to issuance of a returns RMA number, without affecting the Customer’s Statutory Rights. 7.5 In the event that an RMA number is issued it must be clearly identified on a returns label or the external packaging, and also on the internal documentation when the Goods are returned. No markings should be made on the item(s) or item’s packaging. The internal documentation contained within the returns package should include proof of purchase, and the returned item must be complete, and in 'as new' condition with original packaging, and any additional items originally supplied with the item(s) (including but not limited to free gifts, accessories, instructions, manuals). The original manufacturer’s packaging must not be defaced. Goods, or items therein, not complying with these requirements may be rejected as returns by Bookshop UK. 7.6 The Customer will be liable for the cost of remedying any damage to the Goods returned where such damage has, in the opinion of Bookshop UK, been caused by the Goods being inadequately packaged by the Customer or through a fault of the Customer. 7.7 The specific return address for returning the Goods will be supplied to the Customer when an RMA number is issued. This specific return address will be the postal address that the Customer needs to return the Goods to. 7.8 If a Customer returns Goods to any other postal address, other than the specific return address supplied to the Customer by Bookshop UK, then the Customer will be liable to pay an administration fee. 7.9 The Customer must take all reasonable care to ensure that all returned items be suitably packaged, and that the Goods are protected when being returned. The return package should be shipped in a plain outer box with the return address clearly displayed. 7.10 When returning Goods they must be returned in the condition and packaging as supplied to the Customer without any damage, omission or otherwise. 7.11 The Customer must not remove any labels (including but not limited to Batch Number, Bar Code, Serial Numbers, Security Seals) on the Goods and or on their packaging. If the aforementioned are removed or damaged then Bookshop UK reserves the right to reject the return or invalidate any warranty or claim to refund or damages by the Customer. 7.12 Notwithstanding Clause 7.13 Goods must be returned by first class post, or recorded delivery, or special delivery, or equivalent, using Royal Mail, with proof of posting retained for each item returned. 7.13 Bookshop UK shall not be held responsible or liable in any way or form whatsoever for failure to receive returns where there is no Proof of Delivery which specifically means documented evidence by Royal Mail (or equivalent professional courier which must be a recognised registered company) of Bookshop UK having received the return package. Proof of Posting is not acceptable and only Proof of Delivery shall confirm receipt of the Goods by Bookshop UK. 7.14 If the Customer fails to return the Goods to Bookshop UK within seven days of the date of being sent an RMA number, Bookshop UK shall be entitled to recover the Goods by any means necessary and deduct the cost of so doing from any monies owed to the Customer. 7.15 If the Customer does not return the goods as described in these Terms and Conditions Bookshop UK may charge the Customer an administration fee. 7.16 Exceptions to Distance Selling Regulations (2000) include but are not limited to the fact that the Customer does not have the right to cancel the Contract under the Distance Selling Act if the Customer is not a consumer. For the sake of clarification if the Customer is a company, partnership, sole trader or any other commercial body, school, library or registered charity, then the Customer does not have a right to cancel the Contract under the Distance Selling Act. 7.17 The delivery service is contracted-out to third party couriers and is a separate contract that is deemed to have begun and been completed before the end of the seven day cooling-off period. 7.18 If you are completely satisfied that you have received defective item(s) in the Goods supplied from Bookshop UK then you will need to contact Bookshop UK in order to resolve the defect or return the item(s). 7.19 The Customer should contact Bookshop UK by email and include the Customer’s name, email address, telephone number and also include details of the defect (including details of the specific item(s) and the actual fault). The contact details of Bookshop UK for such correspondence are stated in Clause 21.2 and its subsections. 7.20 In the first instance Bookshop UK will attempt to resolve any defects in the simplest manner. In the event that a defect cannot be resolved simply, the Customer will need to return the item(s) to Bookshop UK following the Returns procedure described in these Terms and Conditions. 7.22 When returning defective item(s) the Customer must provide a written description of the defect(s) when returning the Goods. Please note: prior to despatch all Bookshop UK Goods are inspected to ensure they are intact, not damaged and sold as described. 7.23 When returning Goods because there is a fault, only return defective item(s) within the Goods supplied. RMA numbers are issued for specific items only. Please do not return all the supplied Goods because you believe one item may be defective. This does not affect your rights under the Distance Selling Regulations (2000). 7.24 When returning defective items please include all internal packaging, protective or otherwise. 7.25 When returning defective items, Bookshop UK reserves the right to request simultaneous return of any free items that may have been supplied with the Goods (including but not limited to free gifts, accessories, instructions, manuals). 7.26 If goods are deemed to be faulty, returns postage maybe refunded to the Customer only if the returns postage does not exceed the cost charged of initially delivering the Goods to the Customer. 7.27 Any claim by the Customer (including but not limited to damages, omissions, defects or errors) which is based on any defect in the quality or condition of the Goods, or their failure to correspond with the specification provided during ordering of the Goods by the Customer, shall (whether or not delivery is refused by the Customer) be notified to Bookshop UK within seven working days from the day after the date of delivery. If the Customer does not notify Bookshop UK accordingly within the aforementioned time period, the Customer shall not be entitled to reject the Goods and Bookshop UK shall have no liability for such defect or failure, and the Customer shall be bound to pay the price as if the Goods had been delivered in accordance with the Terms and Conditions of the Contract. 7.28 Where any valid claim in respect of any of the Goods, or items contained therein, which is based on any defect in the quality or conditions of the Goods or their failure to meet specification, is notified to Bookshop UK in accordance with these Terms and Conditions, Bookshop UK shall be entitled to replace the Goods (or any part thereof) free of charge, or at the sole discretion of Bookshop UK refund to the Customer the price paid for the Goods (or a proportionate part of the price paid), but Bookshop UK shall have no further liability to the Customer. 7.29 Bookshop UK shall not give any credit for returned Goods where Bookshop UK deems the Goods not to be faulty unless otherwise agreed in writing by Bookshop UK, in which instance Bookshop UK reserves the right to inspect the Goods at the Customer’s cost, prior to such a written decision. 7.30 The Customer can cancel the Contract relating to the order at any time up to the end of seven working days from the day after the date the goods are delivered. The only circumstance in which the Customer cannot cancel the order is where the Customer has taken the ordered Goods out of the sealed package in which they were delivered. 7.31 To exercise such a right of cancellation, the Customer must give written notice to Bookshop UK by letter or email giving details of the goods ordered and date the delivery was received. Notification by telephone is not acceptable. 7.32 As described in the ‘Returns – General Information’ section of these Terms and Conditions (Clauses 7.0 - 7.17) Bookshop UK will then issue a RMA number and the Customer will need to return the Goods to the specified return address. 7.33 Reasonable care of the goods must be taken if the Customer cancels the order. The Customer must take all reasonable care to ensure that all returned items be suitably packaged, and that the Goods are protected when being returned. When returning Goods they must be returned in the condition and packaging as supplied to the Customer without any damage, omission or otherwise. 7.34 When Goods are returned, Bookshop UK reserves the right to request simultaneous return of any free items that may have been supplied with the Goods (including but not limited to free gifts, accessories, instructions, manuals). 7.35 The effective date of cancellation is the date on which the notice is received by Bookshop UK by letter or email. Such notice shall have been deemed delivered to Bookshop UK where Proof of Delivery is available, not Proof of Posting or Sending. (iii) The Customer follows the correct procedure specified in ensuring return of the Goods as described in these Terms and Conditions and any further conditions advised to the Customer by Bookshop UK. 8.2 Notwithstanding Clause 7.26, and Clause 8.1 and its subsections, after returns are processed, Bookshop UK will refund the Customer for any sum that has been paid by the Customer for the Goods excluding delivery charges. Any such payment shall be made within 30 days of receipt of returns, or within 30 days of receipt of the Customer’s payment, which ever is later. 8.3 Any refund or monies due to the Customer shall be paid by any method of payment as determined by Bookshop UK, not necessarily the same method of payment utilised by the Customer when placing the order. 9.1 The risk in Goods shall pass to the Customer upon delivery of the Goods or upon the Goods being appropriated to the Customer but kept at the premises of Bookshop UK at the Customer’s request. 9.2 Bookshop UK remains the owner of the Goods affected by the Contract until Bookshop UK has been paid in full cleared funds for such Goods and all other Goods agreed to be sold by Bookshop UK to the Customer for which payment is due. 9.3 Until such time as the property in the Goods passes to the Customer, the Customer shall hold the Goods as the fiduciary agent and bailee of Bookshop UK and shall keep the Goods separate from those of the Customer and third parties and properly stored, protected and insured and identified as the property of Bookshop UK. 9.4 If any payment due under these Terms and Conditions is overdue in whole or in part, Bookshop UK may without prejudice to any of its other rights recover and or re-sell the Goods or any of them and may enter on the Customer’s premises by its servants or agents to recover the Goods and the Customer shall be liable for all Bookshop UK costs of so doing. 9.5 The Customer shall not be entitled to pledge or in any way charge by way of security for any indebtedness any of the Goods which remain the property of Bookshop UK, but if the Customer does so, all monies owing by the Customer to Bookshop UK shall (without prejudice to any other right or remedy of Bookshop UK) immediately become due and payable. 10.1 To the extent permitted by law, Bookshop UK accepts no liability whatsoever or howsoever arising in respect of loss, damage or expense arising from Goods, advice, or errors, whether or not due to Bookshop UK negligence or that of its employees, agents or sub-contractors. 10.2 To the extent permitted by law, Bookshop UK shall not be liable to the Customer by reason of any representation, or any implied warranty, condition or other term, or any duty at common law, or under the express terms of any Contract with the Customer, for any indirect, special or consequential loss or damage (whether for loss of profit or loss of earnings or otherwise), costs, expenses or other claims for compensation whatsoever (whether caused by the negligence of Bookshop UK, its employees or agents or otherwise) which arise out of or in connection with the supply of the Goods or their use or resale by the Customer. 10.3 The entire liability of Bookshop UK under or in connection with the Contract with the Customer shall not exceed the price of the Goods except as expressly provided in these Terms and Conditions. 10.4 If the Goods Bookshop UK delivers are not what the Customer ordered or are damaged or defective or the delivery is of an incorrect quantity, Bookshop UK shall have no liability to the Customer unless the Customer notifies Bookshop UK of the problem, by email to Bookshop UK within 7 working days after the date of the delivery of Goods in question. 10.5 If the Customer does not receive Goods ordered within 30 days of the date on which they were despatched, Bookshop UK shall have no liability to the Customer unless the Customer notifies Bookshop UK by email of the problem within 35 days of the date on which the Goods were despatched to the Customer. 10.6 If the Customer notifies a problem to Bookshop UK under this condition, the only obligation for Bookshop UK will be, at its option, to make good any shortage or non-delivery; to replace or repair any Goods that are damaged or defective; or to issue Bookshop UK website account credit to the value of the refund due. 10.7 Bookshop UK will not be liable to the Customer for any indirect or consequential loss or damage arising out of any problem the Customer notifies to Bookshop UK under this condition and Bookshop UK shall have no liability to pay any money to the Customer by way of compensation other than reserving its right to refund the amount paid by the Customer, in any way whatsoever, if Bookshop UK deems this appropriate. 10.9 Nothing in this contract creates any right which is enforceable by any person who is not a party to the contract. 11.1 In the event that the Customer makes any claim, whether for repair, replacement, refund or damages or otherwise, in respect of the Goods and whether arising from these Terms and Conditions or otherwise, the Customer shall be liable to pay to Bookshop UK the amount of any costs, expenses, legal fees and disbursements which Bookshop UK may incur should Bookshop UK have to expend monies in considering or defending any such claim which is not proved to have been correctly made. 11.2 In the event that the Customer fails to make payment in accordance with these Terms and Conditions or in any other way is in breach of the Contract with Bookshop UK, the Customer shall be liable to pay to Bookshop UK monetary compensation for any loss or damages, including consequential loss, loss of business and loss of profits, arising from or in connection with the Customer’s breach of Contract, to include all losses which actually occur whether foreseeable to the Customer or not, and in addition the Customer shall be liable to pay to Bookshop UK the amount of any costs, expenses, legal fees and disbursements which Bookshop UK may incur should Bookshop UK have to expend monies in bringing any claim against the Customer whether in correspondence, through proceedings, enforcement or otherwise. 12.1 Bookshop UK shall have no liability to the Customer for any failure to deliver Goods ordered or any delay in doing so or for any damage or defect to Goods delivered that is caused by any event or circumstance beyond its reasonable control. 12.2 Bookshop UK shall not be liable to the Customer or deemed to be in breach of Contract by reason of any delay in performing, or any failure to perform, any obligations of Bookshop UK in relation to the Goods, provided that the delay or failure was due to any cause beyond reasonable control of Bookshop UK. Without prejudice to the generality of the foregoing, the following shall be regarded as causes beyond reasonable control of Bookshop UK:Act of God, explosion, flood, tempest, fire or accident; war or threat of war, sabotage, insurrection, civil disturbance or requisition; acts, restrictions, regulations bye-laws, prohibitions or measures of any kind on the part of any governmental, parliamentary or local authority; import or export regulations or embargoes; strikes, lock-outs or other industrial actions or trade disputes (whether involving employees of Bookshop UK or of a third party); difficulties in obtaining raw materials, supplies, stock, labour, fuel, parts or machinery; power failure or breakdown in machinery. 13.1 Nothing contained herein shall affect a Consumer’s rights under the Unfair Contract Terms Act 1977 or any regulations made under it including the Unfair Terms in Consumer Contracts Regulations 1994. 14.1 If the Customer fails to make payment for the Goods in accordance with these Terms and Conditions or permits any other breach of any Contract for sale or if any distress or execution shall be levied upon any of the Customer's goods or if the Customer offers to make any arrangement with its creditors or if any petition in bankruptcy is presented against the Customer or the Customer is unable to pay its debts as they fall due or if any petition in bankruptcy is presented against the Customer or if being a limited company any resolution or petition to wind up the Customer (other than for the purpose of amalgamation or reconstruction without insolvency) shall be passed or presented or if a Receiver, Administrative Receiver or Manager shall be appointed over the whole or any part of the Customer's business or assets or if any petition for the appointment of any administrator is presented against the Customer or if the Customer shall suffer any actions or proceedings under foreign law, all sums outstanding in respect of the Goods shall become payable immediately. 14.2 Bookshop UK may in its absolute discretion and without prejudice to any other rights which it may have, suspend all future deliveries of Goods to the Customer and or terminate any Contract without liability upon its part; and or exercise any of its rights pursuant to these Terms and Conditions. 15.1 All headings in these Terms and Conditions are for ease of reference only and shall not affect the construction of any Contract between Bookshop UK and a Customer. 16.1 Any provision of any Contract with Bookshop UK which is or may be void or unenforceable (including any provision in which Bookshop UK excludes its liability to the Customer) shall to the extent of such invalidity or unenforceability be deemed severable and shall not affect any other provision of any Contract. 18.1 These terms and conditions, together with the current Bookshop UK website prices, delivery details and Bookshop UK contact details, set out the whole agreement and Contract relating to the supply of the Goods to the Customer by Bookshop UK. These terms and conditions cannot be varied except in writing signed by a director of Bookshop UK. In particular nothing said by any sales person on behalf of Bookshop UK should be understood as a variation of these terms and conditions or as an authorised representation about the nature or quality of any Goods offered for sale by Bookshop UK. Bookshop UK shall have no liability for any such representation being untrue or misleading. 18.2 The nature of Internet communications means that the Customer’s communications may be susceptible to data corruption, interception and delays. Bookshop UK shall not be responsible for any detrimental reliance the Customer places on this website or its contents. 18.3 Bookshop UK is providing its website and its contents (including any downloadable data or software) on an 'as is' basis and makes no representations or warranties of any kind with respect to this website or its contents and disclaims all such representations and warranties, whether express or implied, to the fullest extent permitted by applicable law. In addition, Bookshop UK makes no representations or warranties about the accuracy, completeness or suitability for any particular purpose of the information and related graphics published in this site or that any software or the server that makes it available are free of viruses or other harmful components. 18.4 The information contained in this website may contain technical inaccuracies or typographical errors. All liability of Bookshop UK howsoever arising for any such inaccuracies or errors is expressly excluded to the fullest extent permitted by applicable law. 18.5 Neither Bookshop UK nor any of its Directors, employees or other representatives will be liable for damages arising out of or in connection with the use of this site in any way. This is a comprehensive limitation of liability that applies to all damages of any kind, including (without limitation) compensatory, direct, indirect or consequential damages, loss of data, income or profit, loss of or damage to property and claims of third parties. 18.6 Bookshop UK reserves the right amend the price and availability of any Goods at any time. 19.1 The Bookshop UK website may contain hyperlinks. These hyperlinks connect the Customer to sites of other organisations which are not the responsibility of Bookshop UK. Bookshop UK has used all reasonable endeavours in preparing its own website and the information included in it is done so in good faith. However, Bookshop UK has no control over any of the information the Customer can access via other websites. Therefore, no mention of any organisation, company or individual to which the Bookshop UK website is linked shall imply any approval or warranty as to the standing and capability of any such organisations, company or individual on the part of Bookshop UK. 20.1	Bookshop UK may occasionally offer discount codes to customers. 20.2 Discount codes are exclusive of online postage and packaging and can only be used subject to the Terms and Conditions provided with the discount code, namely that the code can be used a defined number of times, in a defined number of transactions. Discount codes cannot be used with any other voucher, coupon or offer. Discount codes can only be used at time of purchase and not retrospectively. Discount codes can only be used on the website of Bookshop UK. Discounts do not apply to any partner sites. We reserve the right to withdraw codes at any time. 20.3	All discount codes are subject to their own terms and conditions. 21.1 For the purposes of the Contracts (Rights of Third Parties) Act 1999 it is agreed by Bookshop UK and the Customer that nothing in any Contract shall confer on any third party any right to enforce or any benefit of any term of any Contract that may be concluded by them. 23.1 If you are aged 16 or under, please get your parent/guardian’s permission before accessing the Bookshop UK website. Users without this consent are not allowed to access the website. 24.1 These Terms and Conditions will be updated from time to time and any such updates will be made clear on the website of Bookshop UK. 24.2 The latest Terms and Condition will be valid and legally binding, and will replace any previous Terms and Conditions. 25.1 All Contracts between Bookshop UK and the Customer shall be governed by and interpreted in accordance with English Law and both Bookshop UK and the Customer submits to the exclusive jurisdiction of any competent Court in England.